'The Big 50' was published by Triump Books. 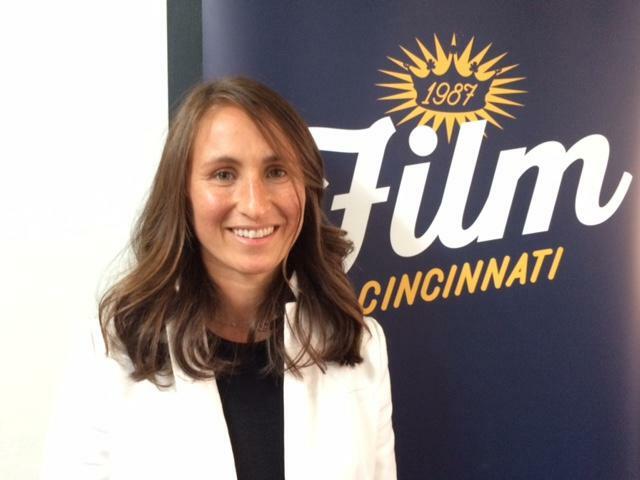 I spoke to Dotson last month for WVXU-FM's Around Cincinnati. You can hear the entire 14-minute interview here. Dotson and Chris Garber first made a list of 100 events and people, then cut it to 75. They finally reduced it to 50 chapters to fit Triump Books' format for similar books about the Twins, Tigers, Giants, Cardinals and Red Sox. And when they thought they had the book written in 2017, Scooter Gennett homered four times in a game that year and they quickly batted out a chapter, knocking Walker Cooper (and his club record 10 runs batted in against the Cubs in 1947) out of the lineup. 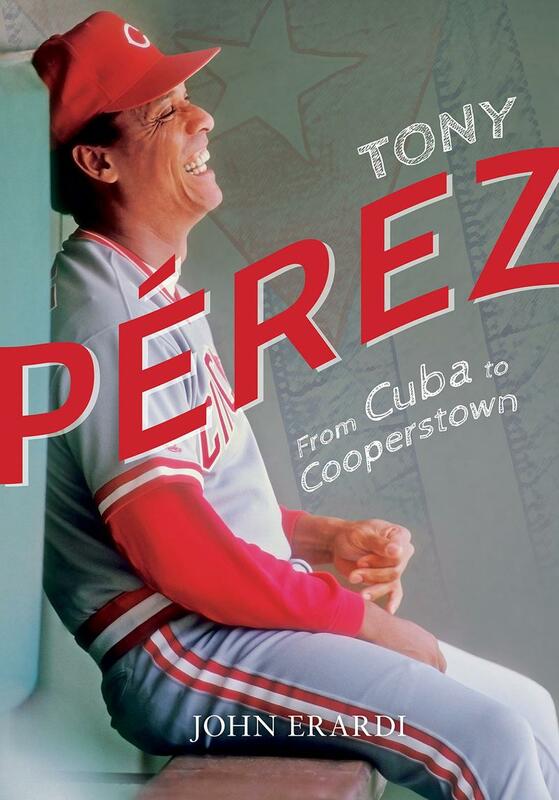 "We call the book a full-color highlight reel of Reds history. My co-author Chris Garber and I just whittled it down till we got to 50 that we felt representative of the different eras in Reds history, which were the most important in shaping the franchise, and the personalities who made the Reds the Reds. We're pretty happy with it." Every World Series except the 1939 sweep by Joe DiMaggio's Yankees' fills a chapter. Most of the playoff teams – not just the 1970s Big Red Machine, but also 1995, 2010 and 2012 clubs – make a chapter. Their list includes Johnny Bench, Johnny Cueto, Pete Rose, Tom Browning, Joe Nuxhall, Joe Votto, Joe Morgan, Barry Larkin, Aroldis Chapman, Tom Seaver, Eric Davis, Adam Dunn, Chuck Harmon, Sparky Anderson, Johnny Vander Meer, and the Marty Brennaman-Joe Nuxhall radio team. 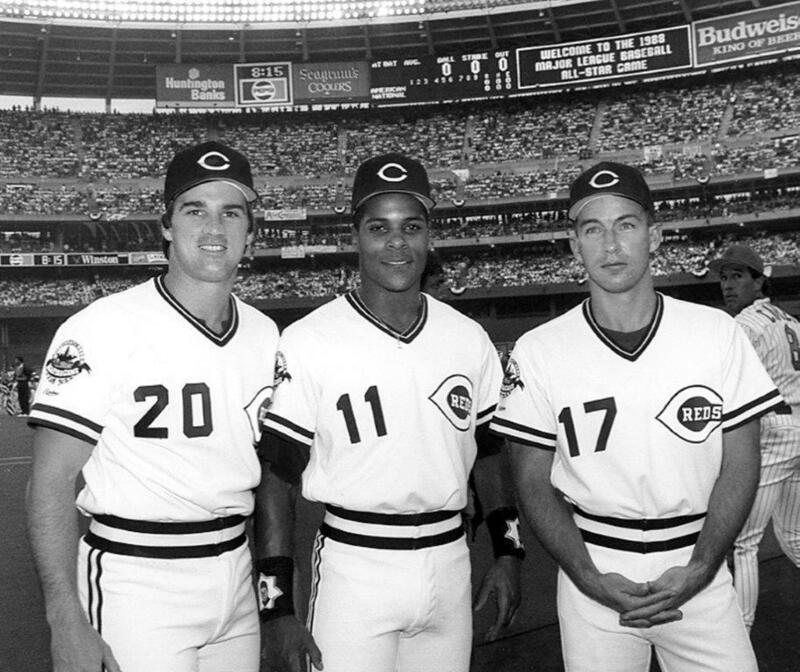 The 1990 World Champion Reds team with (from left) Danny Jackson, Barry Larkin and Chris Sabo is the book's second chapter. 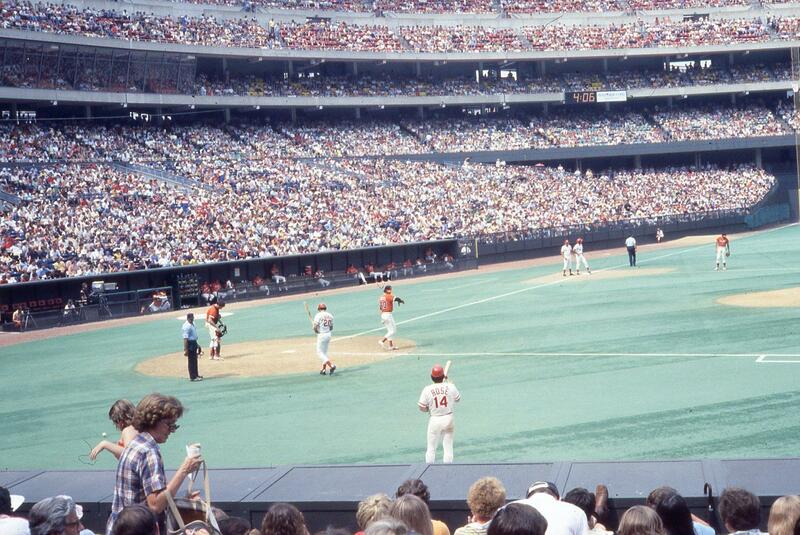 This photo was made when Riverfront Stadium hosted the 1988 All-Star Game. 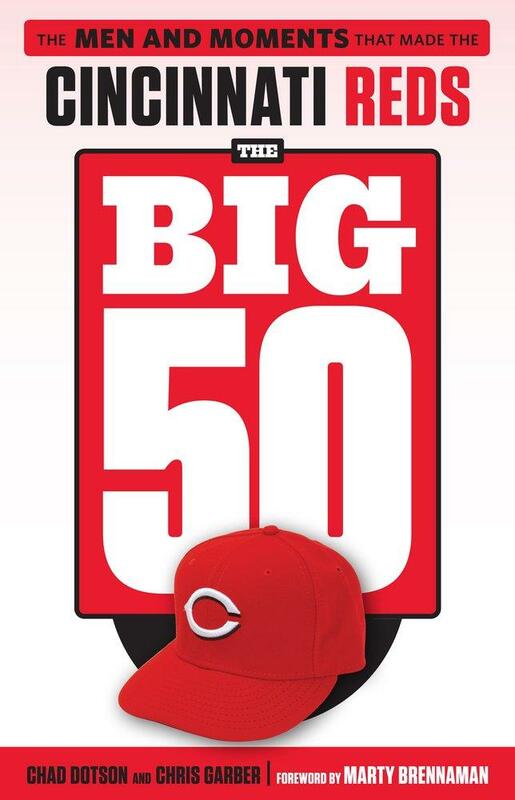 The Big 50 also features Todd Frazier winning the 2015 All-Star Game Home Run Derby; Billy Bates scoring the winning run in Game Two of the 1990 World Series; Art Shamsky's four consecutive home runs in 1966; and the first televised baseball game in 1939 called by former Reds radio voice Red Barber. 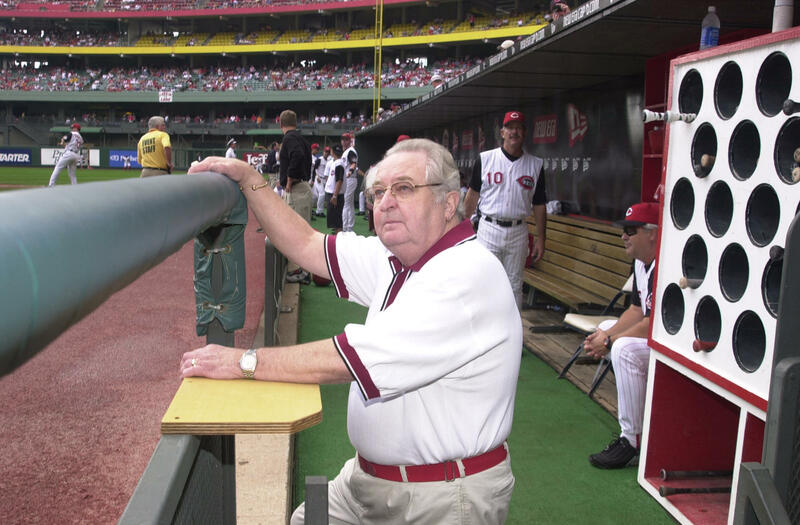 Not making the chapter list was long-time radio voice Waite Hoyt; owner Marge Schott; Jim Maloney's 1960s no-hitters; Hall of Famer Tony Perez; and Ted Kluszewski and the 1956 Reds hitting 221 home runs to tie a National League record. They're squeezed into other chapters. "The book could really be called the Big 65 because we did sort of smash two or more stories into some chapters, because there are so many great stories and great personalities," he says. Slugger Frank Robinson plays a big part in the chapter about the 1961 National League champion team. Dotson regrets not devoting a chapter to him. "In retrospect, I wish we could have fit Frank Robinson in because he gets short-changed in Reds history. Everyone thinks of him as a (Baltimore) Oriole," Dotson explains. Longtime clubhouse manager Bernie Stowe shares a chapter with the Schwab family members who were Crosley Field groundskeepers. "Marge is in a number of places. We didn't shy away from talking about Marge Schott, but she didn't get her own individual chapter… For my generation and the (1990) wire-to-wire Reds, I would have liked more time to explore Chris Sabo, for example. "One of my good friends has given me such a hard time for not having a chapter about Jim Maloney, because Maloney was his guy. If this was the Big 75, he absolutely would have had his own chapter." The Big 50 benefits greatly from the biggest names in sports writing. Dotson and Garber drew quotes and details from Cincinnati and Dayton newspaper Reds' beat writers, as well as 57 books, four national sports magazines and eight websites. "We utilized every opportunity we had, and we really didn't have to travel very far to do it," Dotson said. "We were certainly blessed in the Cincinnati area with absolutely incredible sportswriters over the years. And with YouTube, we were able to watch a lot of these games. We were able to hear the TV commentary and the radio commentary, and it gave us a context at the time for these moments." They made the book extra fun by filling it with footnotes. In the chapter about the 1990 "Nasty Boys" relievers (Randy Myers, Rob Dibble, Norm Charlton), a footnote provides this quote from Schott: "Rob is like a baby! I'd like to just spank him…. And tell him to shut up." "We really had to fight to get some of the footnotes in, because there were so many interesting anecdotes that didn't fit into the narrative, but we felt like we couldn't leave out," Dotson says. The Big 50 is available for $16.95 at Barnes & Noble and Amazon. To listen to my entire interview with Dotson, here's the link again.